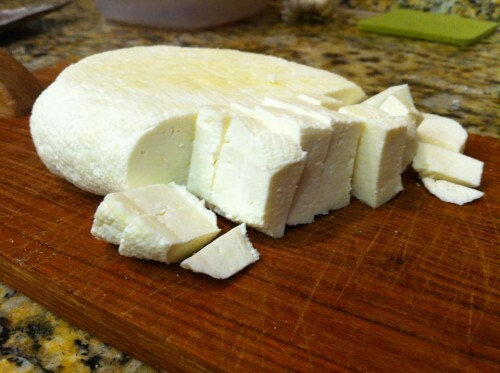 During our cheese class last weekend, we learned that the queso blanco we made is essentially the same recipe as Indian paneer, the main difference being we used lemon juice instead of vinegar to curdle the milk. Evan and I both love Indian food, so I was really excited to try out this new cheese recipe in a dish I’d never thought I could make at home: saag paneer. I went to see if my new World Vegetarian cookbook by Madhur Jaffrey had a saag paneer recipe – and as expected, it did. It also had a tamatir paneer recipe – basically a quick tomato and onion curry. 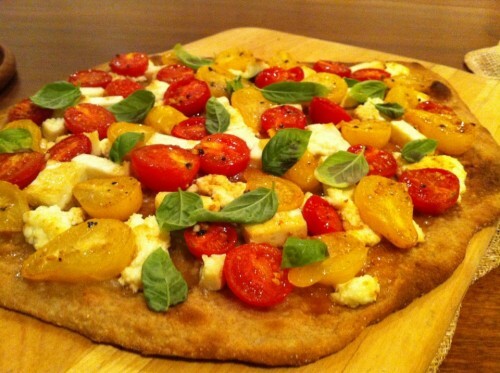 I also tried this one since I had an abundance of tomatoes left over after pizza night and it turned out incredibly well — flavorful, beautifully rich in color, and a great highlight for the fresh cheese. I didn’t take any pictures, unfortunately, and Evan was working late so he didn’t even get to have any. 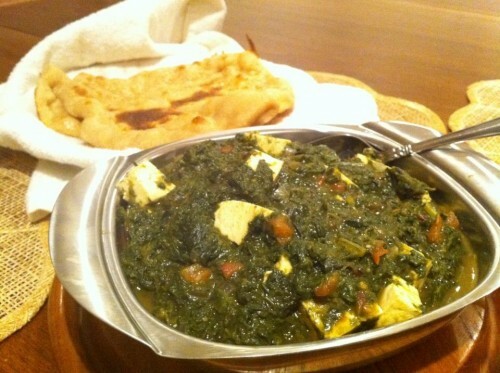 After successfully making the tamatir paneer, I knew the saag paneer wouldn’t be far behind. So I made sure to order spinach in my veggie box this week. The day after it arrived I got to work. I made a fresh batch of paneer (there’s a recipe in the World Vegetarian book, but I used the very similar queso blanco recipe from my class), and got to work cooking down more than a pound of greens – I didn’t have enough spinach so I also used kale and beet greens since I had them on hand (about 6oz of each of the greens – I imagine you can sub in other greens just as easily as needed). Once the greens were soft and mashed up to a texture that seemed about right, I added in just a tiny bit of cornmeal (possibly to absorb some of the water?). I cooked up some chopped tomatoes, onion and ginger, added them to the spinach and added some spices (cumin, cinnamon, cayenne, salt). I cooked it all just a few minutes longer and then added the paneer. Five more minutes of gentle cooking, and we were ready to eat. I also made some fresh naan from a Peter Reinhart recipe. Thankfully I had made a batch a few weeks ago and saved 4 portions in the freezer, so I just had to thaw them out, shape them and cook them quickly in the oven. Sidenote: I love that dough freezes well. All in all, the dinner took just a little over an hour to make, including making the cheese, and it probably could have even gone a little faster had I been more prepared. We’ll definitely be making this one again. Hello, friends! It’s been a while, I know. But this past weekend, I took a cheese and dairy class at Chefs Inc in West LA, and I just had to share some of my cheese making success. The class itself was a lot of fun. Evan and I went together, and we learned all about making fresh cheeses, including mozzarella, ricotta, queso blanco and mascarpone. We also made creme fraiche and butter. The chef teaching the course was pretty hilarious, and kept us entertained through the demonstrations and all the hands-on cooking. We also had a great lunch of all the items we’d made plus fresh bread, berries and tomatoes. The only thing that was a bit strange about the class is that we didn’t get to bring anything home. We made pretty decent quantities of cheese and butter, and though we ate a good deal at lunch, I expected to be taking something home – especially some of the mozzarella that we pulled and formed into little balls ourselves. In any case, not bringing cheese home gave us the opportunity to start making our own right away. Sunday we went out and bought some cheese cloth, organic milk (not ultra-pasteurized), and buttermilk. 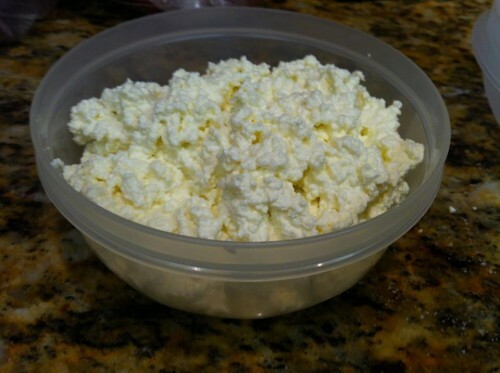 That evening, we made ricotta and queso blanco – both quick, fresh, and delicious. 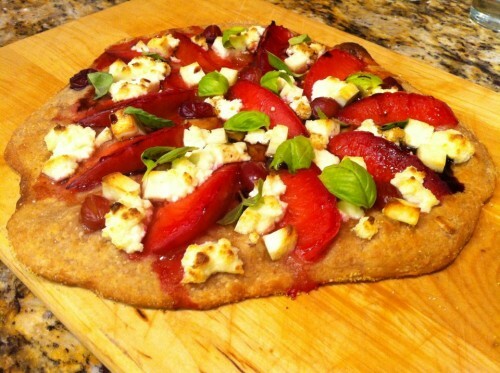 Even though they’re not melting cheeses, I used them on two pizzas, which turned out great. The next night, I used the queso fresco in tamatir paneer – an Indian dish with tomatoes, onions, lots of spices and fresh cheese all cooked together – as queso fresco is essentially the same recipe as Indian paneer, it turned out perfectly. Now we have ordered some additional supplies, like vegetarian rennet, so we can start trying out other cheese recipes soon. We’ll definitely be making more of these.